»Syntax of Eastern Yiddish Dialects« will examine which syntactic structures can be found in the questionnaires of the Language and Culture Archive of Ashkenazic Jewry. As a main aim the project wants to map the variation that can be found in this source of Yiddish dialects which did not attract notice for a long time. Analyses of selected phenomena (e.g. negative concord, particle verbs, word order, relative clauses) will follow. The project also holds a focus on the influence of the coterritorial languages and the relationship to Western Yiddish and older stages of Yiddish. In cooperation with the Columbia University Libraries the project is associated with the chair of Yiddish culture, language, and literature at the Heinreich-Heine-University Düsseldorf. With a one year starting grant by the Fritz-Thyssen Stiftung, first results could have already been achieved. Since 11/2018 we are foundet by the German Federal Ministry of Education and Research (BMBF). Head of project: Lea Schäfer; student assistants: Marc Brode, Jana Katczynski, Florian Leuwer. The LCAAJ was a major project by Uriel Weinreich. It is the largest collection of spoken Yiddish dialects. It contains audio records but also written notes the fieldworkers took in the questionnaire. While most works on the LCAAJ-material focuses on the records, these questionnaires will take the center stage of the current pilot project. The Data this project is dealing with has a long history. The timeline below shows only an excerpt. 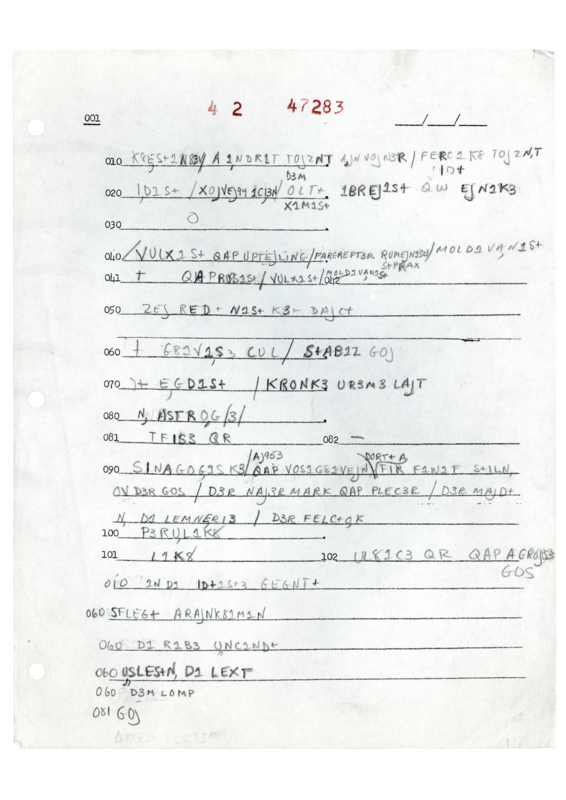 Based at the Columbia University the LCAAJ-project was the last chance of collecting language data from the Yiddish of the "old lands" in Eastern Europe that were destroyed by the holocaust. Uriel Weinreich's aim was not only to archive the old Yiddish dialects but also to gain data for the fields of bilingual and structural dialectology. U. Weinreich's first entry in a diary for the daily progress of the project. This diary contains a pilot questionnaire with 7.000 questions. A final questionnaire of 3245 questions was set after two years of groundwork on June 30, 1961. For the Western Yiddish area a more simplified questionnaire was built by Lowenstein. Between 1959 and 1972 18 fieldworkers collected over 5.700 hours of interviews with nearly 1.000 speakers born in 603 different places. It took an average of 15 hours to process one informant. The death of Uriel Weinreich in 1967 is a hard project setback. In three volumes maps on lexis and phonology were published in the late 1990s by Vera Baviskar✝, Marvin Herzog, Ulrike Kiefer, Robert Neumann, Andrew Sunshine, Uriel Weinreich✝, Beatrice Weinreich. Apart from the Atlas individual studies by Ulrike Kiefer, Gertrud Reershemius, Steffen Krogh and Jürg Fleischer were published in the "Beihefte zum Language and Culture Atlas of Ashkenazic Jewry". The project "Evidence of Yiddish documented in European Society" (EYDES) offers transcriptions of some interviews and interactive mapping of selected lexemes in an online plattform www.eydes.de. Thanks to a grant of the National Endowment for the Humanities the Columbia University Libraries were able to digitalize the archive documents including the questionnaires as part of the estate of the late Marvin Herzog. On January 22, 2018 the website with the digitalized questionnaires went online and the data is open for every kind of research. Schäfer, Lea (forthcoming): »Möglichkeiten und Grenzen der Fragebogenmaterialien des 'Language and Culture Archive of Ashkenazic Jewry' am Beispiel der Wortstellung von Verbpartikeln« In: Colloquia Germanica Stetinensia. Yiddish as a Germanic Language, Small languages big ideas, University of Zürich, 04.–05.05.2019 . Modus und Tempus im Jiddischen, Kolloquium "Sprachvariation und Sprachwandel", WWU Münster, 15.03.2019. Dialectology at a Distance: The Survey of the Language and Culture Archive of Ashkenazic Jewry. Minor Languages in Europe during the Late 19th and the 20th Century: Strategies of Coping with Marginalization, 31.01.2019 LMU München. Projektvorstellung im Rahmen des linguistischen Forschungskolloquiums der Germanistik an der Heinrich-Heine-Universität, 11.12.2018. Ist eine jiddische Dialektsyntax möglich?. Vortrag am 5. Saarbrücker Runden Tisch für Dialektsyntax (SaRDiS), 10.11.2018. Die Erschließung des »Language and Culture Atlas of Ashkenazic Jewry« für die Dialektsyntax: Ein Pilotprojekt. (Halbplenarvortrag) 6. Kongress der Internationalen Gesellschaft für Dialektologie des Deutschen (IGDD), Forschungszentrum Deutscher Sprachatlas, 13.–15.09.2018. Das Potential der Fragebögen des »Language and Culture Archive of Ashkenazic Jewry« für eine historische Dialektologie des Jiddischen Vortrag am XXI. Symposium für Jiddische Studien in Deutschland Heinreich-Heine-University Düsseldorf, 3.–5.09.2018. Wortstellungsvariation in den Materialien des Language and Culture Atlas of Ashkenazic Jewry. Das 110-te Jubiläumsjahr der Konferenz von Czernowitz – linguistische und kulturelle Aspekte des Jiddischen. Universität Stettin, 11.–12.04.2018. 11.–13.06.2019 Organization of the conference Yiddish Language Structures 2 in Düsseldorf. 26–28.06.2019 two poster at ICLaVE 10: Change of multilingualism: language situations of 20th Century Yiddish Speakers and Auxiliary Selection in Yiddish Dialects. 25.–26.09.2019 Zwischen Multidialektalismus und Überregionalität: Zur Sprachsituation des Jiddischen im östlichen Europa des frühen 20. Jahrhunderts. Vortrag im Rahmen der Abschlusstagung des BKM-Projekts Die Nationalsprache der Juden oder eine jüdische Sprache? Die Fragen zur Czernowitzer Sprachkonferenz in ihrem zeitgeschichtlichen und räumlichen Kontext, University of Augsburg. 7.–9.11.2019 Wie bairisch ist Jiddisch? 14. Bayerisch-Österreichische Dialektologentagung (BÖDT), University of Salzburg. For more news follow @seydproject on twitter or if you don't want to use "social-media" you'll find older posts here.